Built using the West epoxy system. Extra heavy duty trailer with rollers. Maroon bimini top and enclosure. Custom swim platform. New Mercury 150 horse outboard motor. Boat and motor only has 1 hour of dealer testing and preparation run time. Owner never put boat in water thereafter due to health which forces sale. Boat has been tarp covered in garage since completion. Owner has dozens of construction pictures for viewing, wood samples, etc. for serious inquiries. You can contact Paul at (989) 734-2393, or rspens@sbcglobal.net. I now have two Penobscot 13s in my shop, one ready for spars and rigging, and the other ready for planking. They will both have lugsail rigs. I have made the mast and spars for the first, but I will set these aside until the weather warms up. I like to varnish masts and spars in the loft above my shop, where they are out of the way, and where they are not exposed to dust from other work, but it’s much too cold there at present, so I will wait until the weather warms up a bit. It can get quite warm in the loft on a sunny day, even if it’s cold outside, as there is no insulation under the roof. These two boats are the last at the price I have been offering. I keep a log when I am building them, and the time is surprisingly consistent from one boat to the next – always within a couple of hours. Although the work is mostly very pleasant, I feel that I need to do better. I have increased the price for a basic finished boat to $5,175.00, an increase of 12%. I realize that it’s quite a jump, but I think that it is still very good value for the money. I have kept the price for a bare hull at $2,550.00. The issue is that a lot of time goes into sanding and painting and varnishing on a finished boat. With a bare hull it’s a lot more obvious where the time goes, and easier to justify the price. I hope to be able to keep these prices for the foreseable future. Last year’s resolution was to keep up my Facebook page. It didn’t last long – I just don’t relate well to Facebook. This year I have started a newsletter, which I plan to send out every two months or so. I think that this will be easier for me to keep up. If you would like to receive the newsletter, send me an e-mail at archhdavis@gmail.com. If you would like to contribute materials or have an idea for the newletter, let me know. Luis Dominguez sent these photos of Patricia Ann, his Penobscot 17, in October 2018. I built the hull for Luis in 2016 – he took it home and finished it himself. I had the pleasure of meeting Luis when he came to my class on building the Penobscot 13. He writes, “I’ve been meaning for some time to send pics of the finished boat but life intervened in the form of some medical problems for Pat and me. That part was frustrating, as the boat was finished last May - except of course for last minute details that seemed to follow one anther. We eventually sailed the boat off Mackeys Marina across the Albemarle Sound from Edenton. Then we had to cut the experience short due to “little Florence” coming for a visit to the Carolinas. The boat sails beautifully. “That one sailing experience was in very light winds — I am a devotee of heavy winds from my days in Northern Ohio, so 4-8 knot winds were frustrating me. The thing is, though, that in those winds the boat sails very quietly. I was taken aback by how far we got on very light winds. We are going back to the coast in November in search of better winds. A Peapod, and Some Ideas. Andrew Legun sent these photos of his 12ft peapod, which incorporate some good ideas on hanging the rudder, and loading the boat onto his car. Gudgeons and pintles on a double ended boat with a curved after stem are a little problematic – the pintles have to line up in order for the rudder to be able to swing side to side. Andrew used an alternative method – an aluminum rod through pairs of strong screw eyes epoxied into the rudder and stem. The lower screw eye in the rudder is mounted on a wooden block to allow the rod to clear the stem. He comments that he has found the boat a little tender under sail, noting that there is a trade off between size and weight, and portability. He adds, “I think the row and sail aspects are close to optimal for a boat this size. It looks classy.” It certainly does – and he has done a classy job with it! My wife and I have arrived back from our vacation in Slovenia, where she has family. I have caught up on orders and correspondence, and am ready to start on a Penobscot 13. We had a great time – we spent the first two weeks in a language school, learning Slovene, then spent the last week with my wife’s family, and being tourists. Slovene is a very difficult language, and I can never hope to be fluent, but I guess we made progress (they worked us very hard). 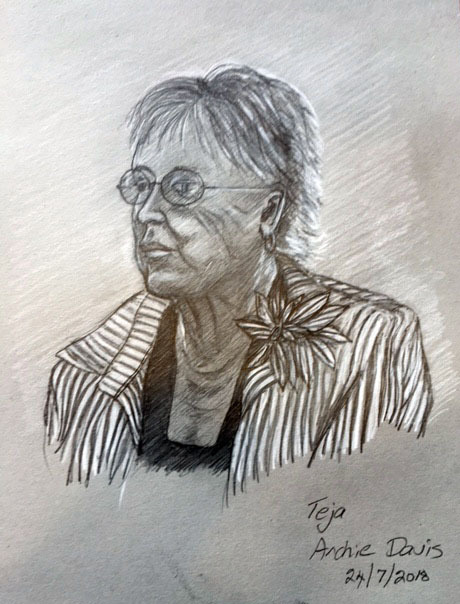 The drawing shows Teja Glažar, who is a famous (in Slovenia) actress in films and on television. She is distantly related to my wife, and we met her for coffee. My wife has a collection of old family photographs that she wanted to see. I did the drawing while she was talking to my wife and some other family members. It wasn’t easy, as she was moving all the time and the lighting was also difficult, but I think the result is a reasonable likeness. Anyway, she liked it, and I gave it to her. 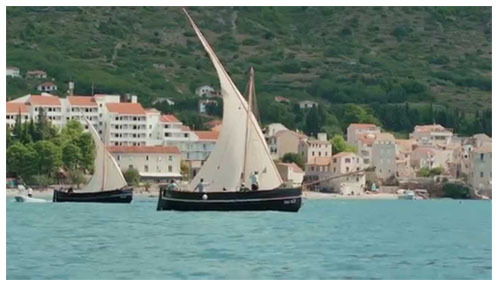 Unfortunately I missed an opportunity to meet with a Penobscot 14 builder, Aleš Verdir, in Piran, on the Slovenian coast, a few miles from where we were staying. I was not checking my e-mail while we were away, and I missed his invitation, which came after we had left. Next time, Aleš, if you are reading this! Thanks Vlado, and enjoy your project! In July my wife and I will be taking a long-planned vacation in Slovenia, where she has family. I will not be able to answer questions or take orders while I am away. You can place orders or make enquiries as usual on my web site – I will take care of them as quickly as possible when I get back. We leave on Thursday, July 5, and return on Monday, July 30. 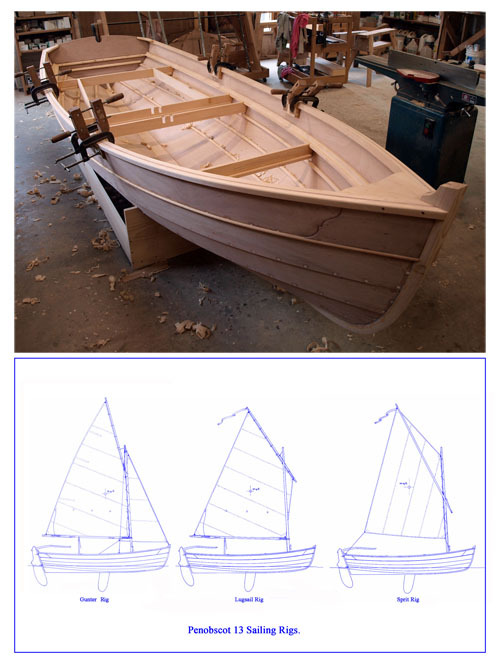 I will also be away at the Wooden Boat School in Brooklin, Maine, teaching my course on building the Penobscot 13, during the last two weeks of August, leaving on Saturday, August 18, and returning on Saturday, September 1. I hope this doesn’t cause too much inconvenience. We are very much looking forward to our trip, but I will also be looking forward to getting back to work, and answering your questions! The top photo shows us at Anna’s and Marko’s wedding three years ago. Weddings are a big deal in Slovenia. This one started at three in the afternoon, and the reception was still going strong, with bands and dancing when we left at about 1:30 the next morning. I was foolish enough to ask if there was going to be music at the wedding. I counted five different groups – the choir and small orchestra in the church, a string quartet outside the church after the ceremony, and three groups at the reception. Anna and Marko are now the proud parents of a two-year-old. My e-mail address has changed. It is now archhdavis@gmail.com. If you have recently sent me an e-mail at the old adress on my web site, or sent a message through the “Contact Us” page on my web site, and haven’t received a reply, please try again at the above address. I am normally able to respond to e-mail enquiries within 24 hours or less, so if you are waiting for a response, please try again. I lost access to the old address on April 2. Thank you for your patience. With two weeks of brutal cold and two blizzards behind us, and plenty more to come, it’s time to think of spring! The Penobscot 13 in my shop is well along, and I expect to have it finished early in February. If you would like to have this boat for a spring launching, now is the time to get your order in. There probably won’t be another one available before summer. At this point there is still the opportunity to customize the boat to your preferrences. It will have a daggerboard trunk installed, but you can specify a sailing rig, with the mast step to suit. I haven’t painted the boat yet, so you can also choose your own color scheme. The price is $4,450.00. You can add any of the three sailing rigs yourself, or have me do it – call for pricing. 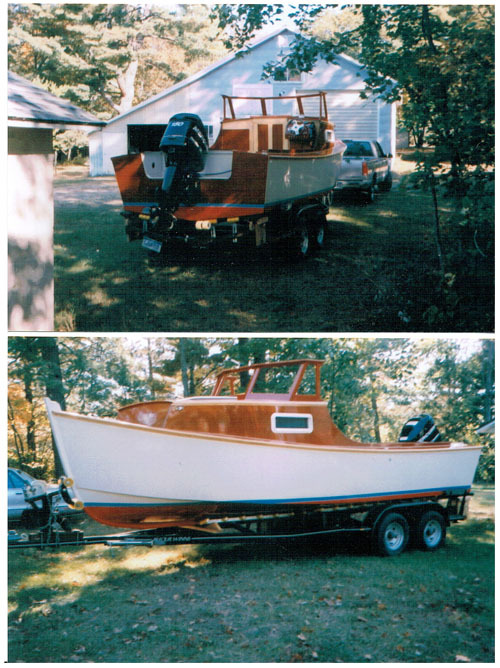 If you would like to see your boat featured here, send photos and a description of your project to Arch Davis Design, 37 Doak Road, Belfast, ME 04915. We would love to see them - we are always looking for good picture of boats under way! All plans from Arch Davis Design are backed by a free advisory service. 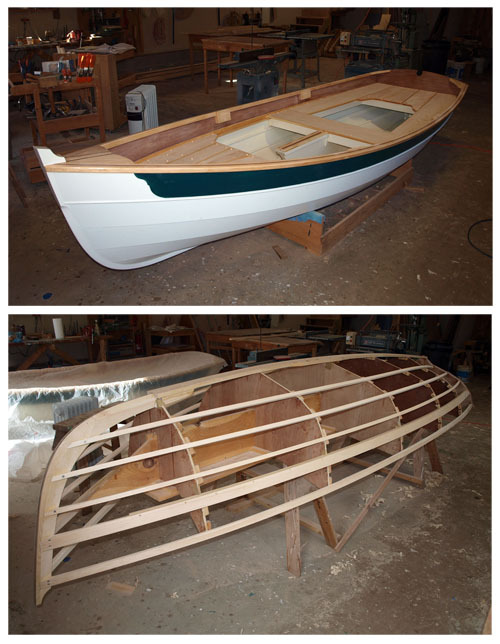 If you have a question or a problem when you are building your Arch Davis designed boat, call 207-930-9873 between 10:00 am and 4:00 pm, including weekends, for advice from the designer.